Penang Jewish Cemetery is all that's left of Penang's once prominent Jewish community which played an important role in the city's history. 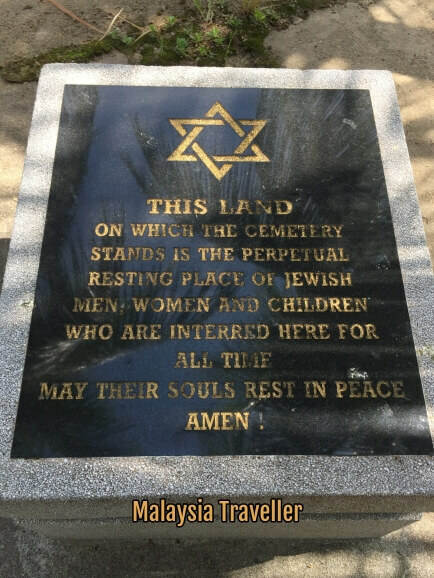 According to a plaque at the entrance, the cemetery was established in 1835 and is thought to be the oldest Jewish cemetery in Southeast Asia though there may be older Jewish graves in other non-Jewish cemeteries. 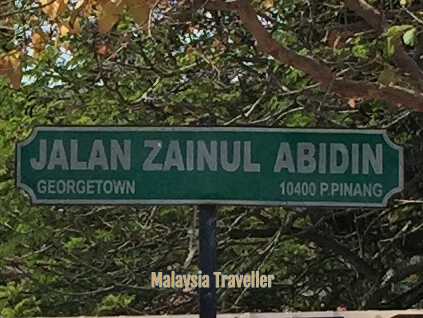 It is located on Jalan Zainal Abidin which used to be known as Jalan Jahudi (Yehudi Road). Today this characterless street comprises some dreary government housing blocks and a few old shophouses. 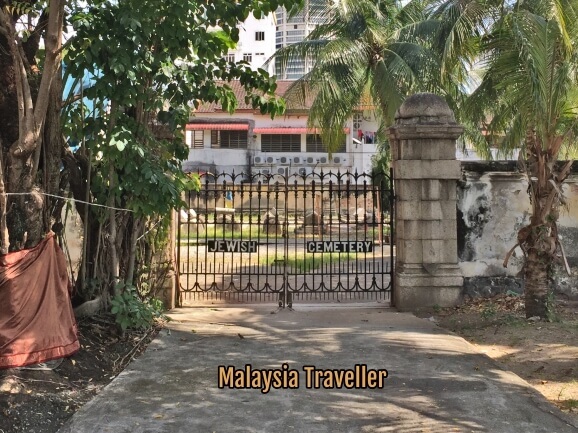 The family home of P.Ramlee, Malaysia's most celebrated singer, actor and director used to be located here. 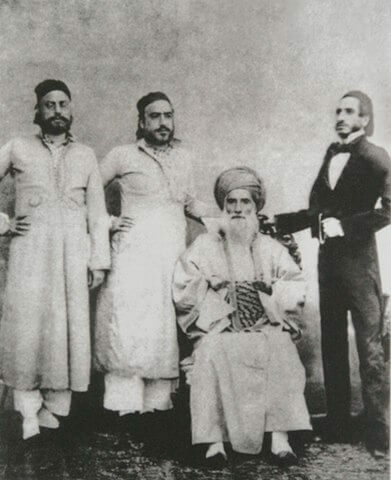 Jews may have been trading in the Malay Peninsula for hundreds of years but in Penang they can certainly trace their origins back to the 1830s when the 'Baghdadi' Jewish population fled Persia to India and onward to Singapore and Penang to escape persecution. They engaged in various trades such as tailor, scribe, jeweller and money-lender. While some were poor, others became very affluent and successful. 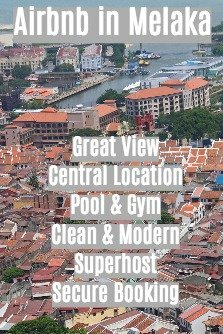 There was a synagogue in a converted shophouse at number 18 Jalan Nagore, George Town. 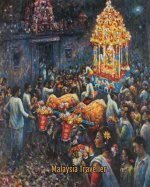 At their peak in 1899 the number of Jewish settlers was only 172, declining to just 30 by 1941 when the remaining families were mostly evacuated by the British to Singapore prior to the invasion of Penang by Japan. After the War the few remaining Jews on the island migrated to Singapore, Australia, Israel and USA. By 1969 there were only three Jewish families left and now they are all gone. 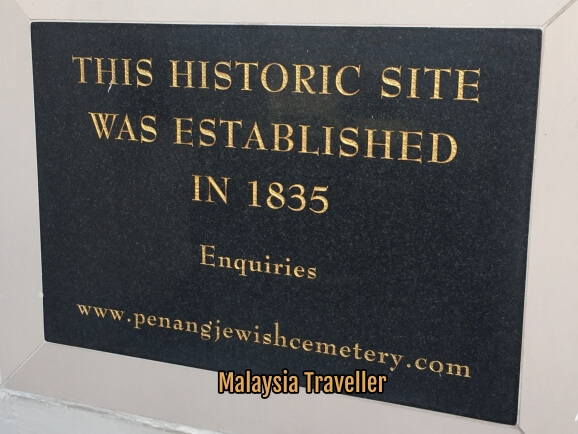 You can read more about the history of the cemetery and the Jewish community in Penang here. There are 107 graves in the cemetery. The caretaker Mr. Raju pointed out a few graves to me, including this one, the oldest in the cemetery dated 9th July 1835. I cannot read Hebrew but the history sheet stuck in the visitors' book says it belongs to Mrs. Shoshan Levi, an English woman who donated the land where the cemetery stands. The last person to be buried here? 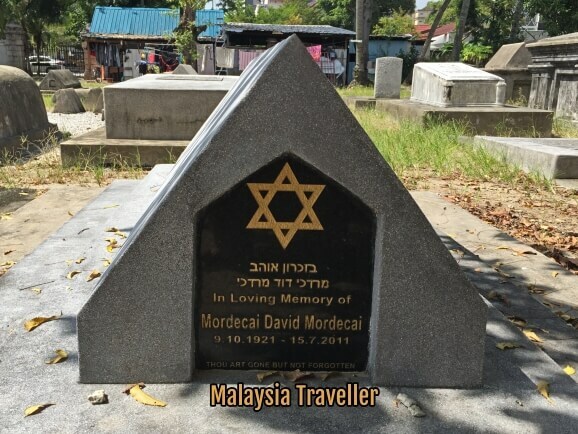 This is the most recent and perhaps final person to be buried in the cemetery, Mordecai David Mordecai who died on 15 July 2011. Mr Mordecai was a former E&O hotel manager. 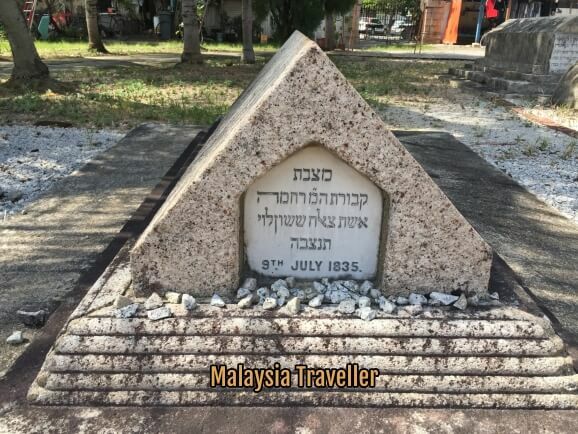 Mr Raju said this will be the last grave as there are no more Jews in Penang. Many of the graves are topped with a pyramidal shaped cover said to resemble ossuaries found in Israel where bones from several bodies were kept together. They were originally made of wood and hinged to enable the easy addition of more bones. This shape became a model for stonemasons to copy. From what I can read online, Cohens have a priestly status and may not come into contact with any dead body and Cohens are buried on the edge of the main cemetery so that relatives can visit without entering the cemetery. Levites also have a special role in Judaism. The Cohen section contains a British war grave. 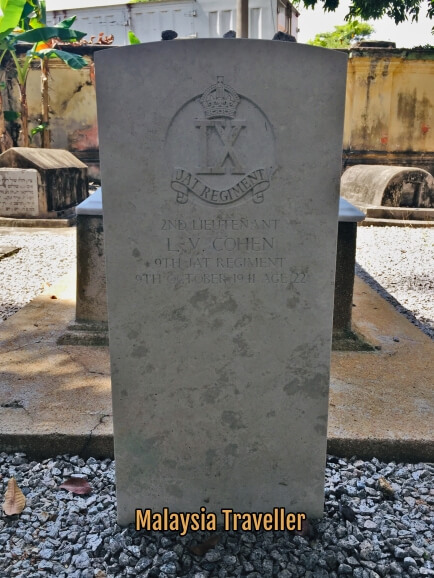 The Commonwealth War Graves Commission records show him as 2nd Lieutenant Louis Victor Cohen of the 9th Jat Regiment who died on 9th October 1941 aged 23. He was the son of Sassoon Jacob and Seemah Cohen of Calcutta. He died two months before the Japanese invasion of Malaya, reportedly in an accident. 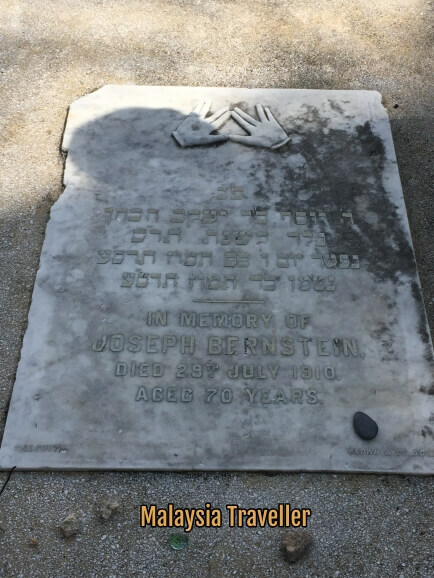 The hand symbol on Joseph Bernstein's grave apparently denotes that he was a Cohen. The cemetery is being well looked after by the caretaker and the Trustees with the support of private donations. It is a poignant place to visit even if you have no Jewish ancestry. The gates to the cemetery. The caretaker and family live in a shack in the cemetery compound so if the gates are locked he may open them for you.